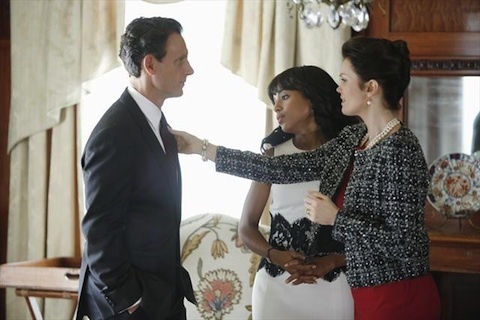 Last night's episode of Scandal left off with a whopper of a cliffhanger. Rest assured, we won't have to wait more than a week to see where things pick up from the shocking final moments of last night's "Defiance." Check out the suspenseful promo for next week's "Happy Birthday, Mr. President" ahead. Obviously, if you haven't gotten caught up on Scandal, up to "Defiance." I'll admit, I only just got on board with Scandal (thanks to Netflix and ABC's app), but much like Olivia is with the Senator, I'm "all in" with this show. Of course, I don't totally buy that Olivia is really all in with Edison Davis. Maybe she would have been if given some more time, but with the President getting shot, something tells me that whatever feelings she's tried to bury will resurface in an instant as he struggles for his life. The promo for next week's "Happy Birthday, Mr. President" show the chaos that ensues after Fitz is shot. He'll be ok, of course. He has to be!… Right? Here are a couple of photos from the episode. Flashbacks, perhaps? SCANDAL- "Happy Birthday, Mr. President" - In the wake of a tragedy connected to the White House, Olivia returns as Press Secretary to handle a catastrophic crisis, on "Scandal," THURSDAY, DECEMBER 6 (10:02-11:00 p.m., ET) on the ABC Television Network.